I have not and I do not think I shall ever get over the hate and bigotry that murdered this little three year old Mucaad Ibrahim on 15 March 2019 in Christchurch. He was shot twice by an Australian white supremacist Brenton Tarrant : the first when he was on his father's lap in the Al Noor Mosque and the second time in the head when he was separated from his father, calling out "Daddy, Daddy"! During his funeral, little Mucaad "was carried aloft in a shroud - almost weightless", wrote the reporter from New Zealand Herald. How do you fathom the images and trauma in this survivor's soul and being? The victims and survivors of that massacre in Christchurch were all Immigrants: from Palestine, Egypt, India, Pakistan, Syria, Libya, Iraq and several other Muslim countries torn apart by war and poverty; who had hoped for a better life in New Zealand. But it was not to be. There are other immigrants too, from another time and another country who sought and were given refuge and succour in a foreign land far away from their motherland. They not only survived but also prospered enormously. See Video below on the 10 richest people in Malaysia- January 2019 - all the sons of Mr Chiak Boh Liau. If only those immigrants at Christchurch were as lucky as these. The claim to victim-hood has become one of this century's foremost fads. Every one demands the right to be victims of oppression, bullying, persecution, exploitation and discrimination. Forget about being heroic which involves being courageous, unselfish and gallant and true. When does a manipulative whinger become a victim? When does a snow flake turn into the tormented? When does a 'victim' become a martyr? 50 people were viciously murdered at prayer -'victims nonpareil' - by an ideology that is no different from that which created The Holocaust of the Second World War. So I was quite amused to read about our 'Made in Malaysia' victims of oppression, discrimination. persecution etc etc being given so much publicity and succour from the Press and even a Minister! All these Little Corporals , all these pathetic "cry babies" how well they grow in Malaysia Baru. Malaysia's Little Corporals - Anak Pewter demanding to be Anak Emas and using dirty water to quench a fire. A sow may whistle, though it has an ill mouth for it. George Forbes, 1760- 1837. It was my one and only sister's birthday yesterday. This is my tribute to her for what she has accomplished as a daughter, a sister, a sister-in-law, a wife, mother and grandmother. In 1953, she received a fantastic gift of a poem written in her Autograph Book. It was lovingly and beautifully composed by Pakcik Agus, a Minang man and a good friend of Abah. Cpl Jamaludin from Klang, flanked on his right and left by two Minang men. For my sister and I, a birthday is just another day. Our generation gave scant notice and celebration for the day we were born. But now that we are getting closer to our eighties, we tend to reflect on what has been. Charlotte Bronte's statement comes close to what we feel about getting older. AsH is not impressed by the present but the past means a lot to her. A gap of nearly 50 years for two sisters. More and more years under the bridge. We now have Abah's and Emak's first, second and third generation. We have also added two Buchanans to our clan. What a grand family we have! But I have to return to Pakcik Agus' declamation -a poignant and touching wish from the heart for the next generation. And here he expresses the hope and expectations of parents - and especially Malay parents. This posting is not just about Chermin Maznah by Agus Karimudin for Maznah Abdul Hamid. Have we Malays done our duty and our best ? "Melihat keturunan ku berjaya maju. Jadi ikutan bangsa dan keturunanku." Noraka kutakuti, Sorga ku Kenang. Ku maju dan modern, ku jaga marwahku. That is why my memory "retains vividly those of earlier years." Yesterday the husband of " Elizabeth II, by the grace of God, of the United Kingdom ........... Head of the Commonwealth, Defender of the Faith " i.e. the Christian Faith, was involved in a bad accident. Worries and prayers were expressed by the Ugandan-born Bishop of York, Bishop John Tucker Mugabi Sentamu. Perhaps if Malaysia (old or new) had a Christian Royalty, some of her rakyat and elite might be a tad more respectful, tolerant, understanding and accommodating towards having a "Yang di Pertuan Agong" as Head of State. Let's take more steps backwards - to more than 61 years ago , to just about 65. 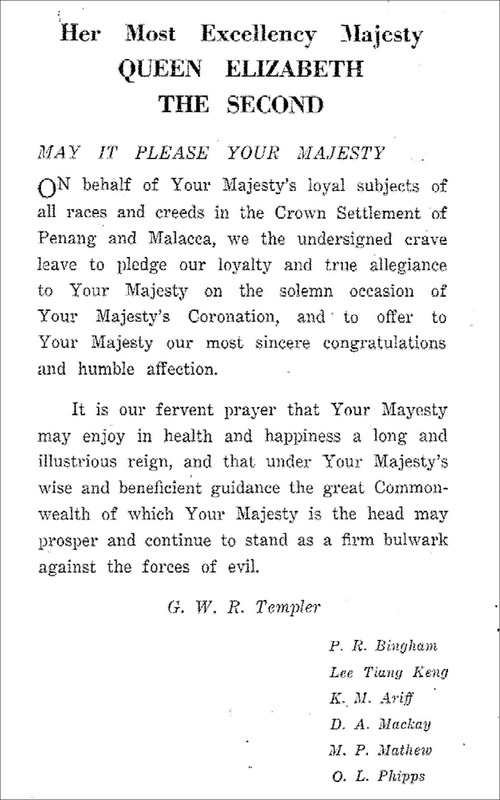 Note the unctuous deference to the British Queen in pre-independence Malaya, specifically 1953. And by the way, that loyal and humble subject Dr Lee Tiang Keng plotted secession for Penang to break away from the Persekutuan Tanah Melayu (Federation of Malaya) and join forces with Singapore - why kowtow to Malay Sultans? Looking at the non-white membership of the Singapore Legislative Council, no wonder my Chinese fellow undergrads at Singapore University mocked the title of the Yang di-Pertuan Agong. 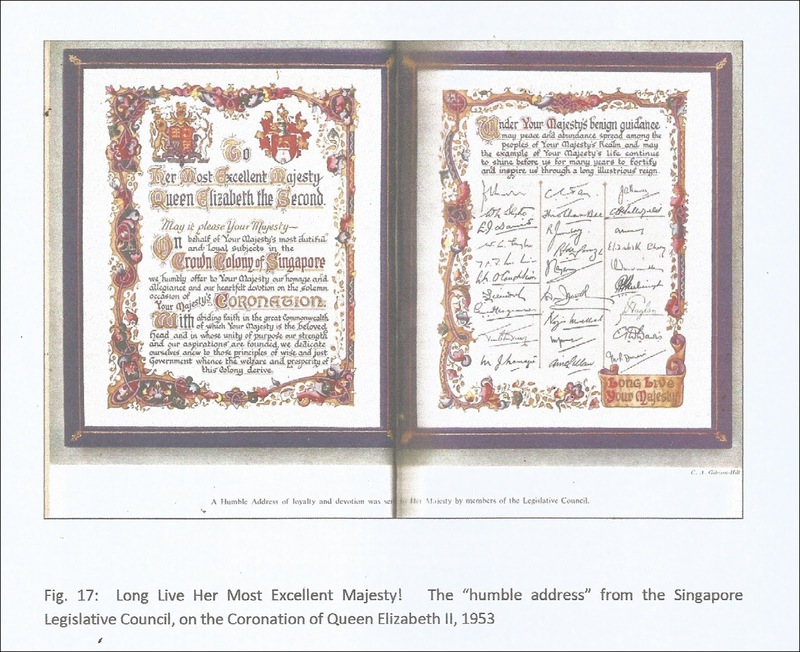 Ash's experience at Singapore University from the early to mid-1960s. So, this contempt for the institution of the Malay monarchy has a long, long pedigree. 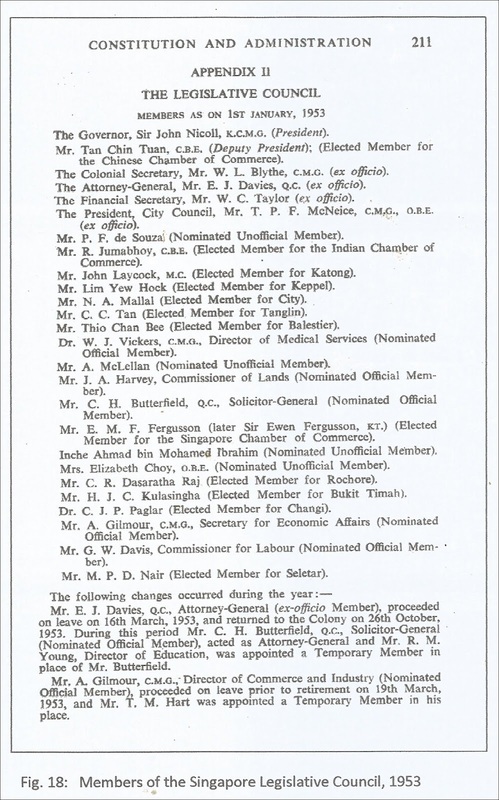 People like Eric Liew and Richard Chung and countless others are simply carrying on with the tradition of their forefathers. ..... who contributed his thoughtfully reasoned analysis (after all, he's a university graduate) on the Agong's resignation. I see no need for me to repeat his masterpiece. Besides all the others - Malays and non-Malays - baying at this Institution of Monarchy, we have the classic, oft-repeated pecuniary rationale of "we pay the most tax, so we have the greater say!". There are after all, many other Malaysians who have made "contributions" and paid a different price for sustaining the well-being of Malaysia.
" The ethnic profile of police officers has been traditionally disproportionate compared to the national ethnic profile with a significantly higher proportion of ethnic Malays especially in the earlier decades. However the number of casualties involving ethnic Malay police officers are statistically higher overall due in part to the high mortality rates involving the ethnic Malay community during the Malayan emergency in the 1950-1970s, and in part to the ethnic composition of the police force." From the above Table, the Malays paid in 1,016, the Chinese 98, the Indians 27 and the Eurasians 69 - LIVES, not ringgit and cents. You could say that those members of "Bangsa Malaysia" who eventually became today's high-rate taxpayers were given the luxury/opportunity to study, work and prosper in peace because the Malays were protecting their rice bowl. So, we can look forward to a new Malaysia pledging to undo all the mismanagement and miscreants of old Malaysia. The past 61 years have been rubbished. But let's learn from an old Malay poem. Dahan ! Dahan ! kenapa bengkok ? Burong ! Burong ! sebab apa hinggap dahan? Ikan ! Ikan ! kenapa timbul? Sebab ada lembu masok sungai. Lembu ! Lembu ! kenapa masok sungai ? Orang ! orang ! kenapa di-pukul lembu? Sebab lapar, hendak makan nasi. Nasi ! nasi ! kenapa engkau mentah? Api ! api ! kenapa tidak bernyala ? Kayu ! kayu ! kenapa habis basah ? Hujan ! hujan ! kenapa engkau turun ? Katak ! katak ! kenapa sudah memanggil ? MINUM DALAM PERIGI DI-BAWAH POKOK ? The bough (dahan) of this Malaysia will remain bent and crooked because the country still embraces the incompetent, stupid, arrogant and nefarious birds, fish,cows, humans, fire, firewood, rain and most of all, the cursed voracious frogs. SELAM (AT) KAN MALAYSIA ! Insolence from a 4000 year-old Value System. 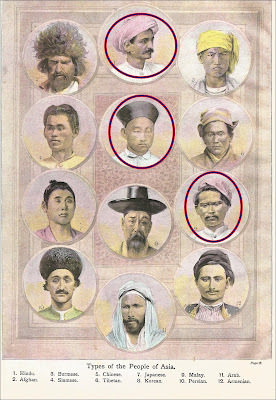 The barely 200 year old (dating from 1789) Semenanjung Tanah Melayu aka Malaya aka Malaysia is made up of some of these peoples from Asia. TYPES of PEOPLE from ASIA : From "Wide World Reader". The Malay and the two members of two great civilizations are circled in red. 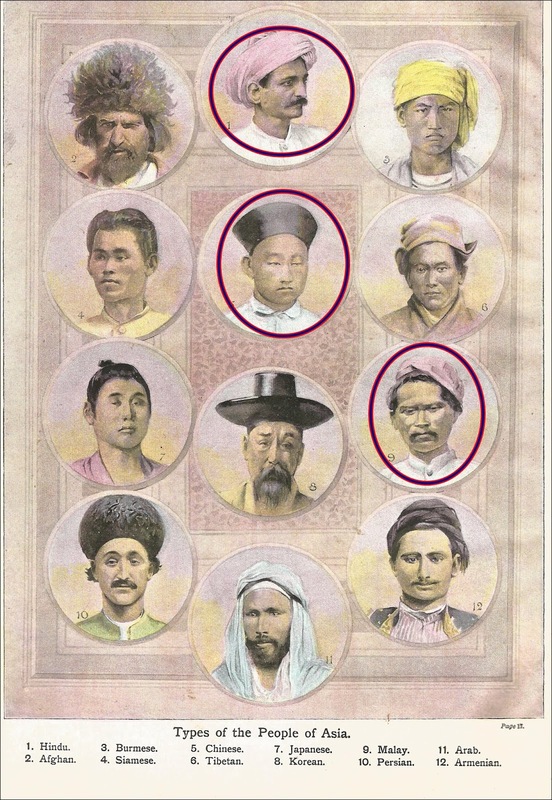 There are the natives, the bangsa Melayu or Malays of the Semenanjung, the bangsa Cina from China and bangsa India from the Indian sub-continent. The last two groupings belong to two of the four great civilizations of the world - with a long pedigree behind them. (Babylon and Egypt are the other two). It is puzzling that the peoples of these two great civilizations should find themselves cast into the Malay Peninsula, this finger-like extension of the Asian continent. The Semenanjung, before the penetration by Christian Europeans was known as quite an inhospitable area of dark forests, muddy rivers, hot and humid climate and almost uninhabited except for the coastlines,along the river-banks and estuaries where Malay chiefs and Sultans had set up their own territorial Sultanates sometimes in conjunction with other Malay chiefs and Sultans from the Southeast Asian Malay Archipelago. This political and cultural setup was in many ways very similar to the beginnings of the history and culture of the countries that make up Europe today. 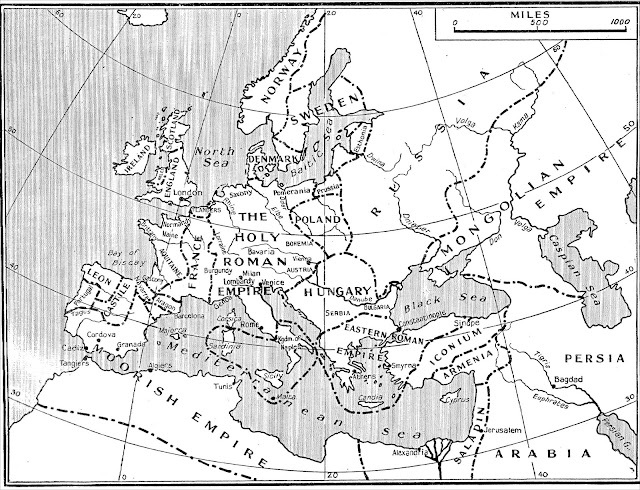 Europe 12th century. In the Malay Archipelago, we have for instance, the Riau-Lingga Empire, the Sulu and the Brunei Sultanates and the Malacca Empire. 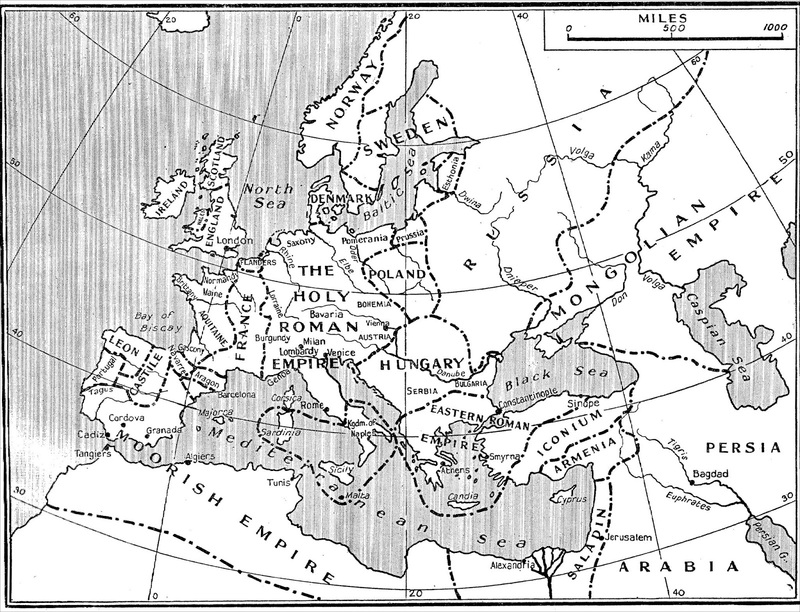 Europe at the beginning of the First World War which was actually a bloody European Civil War , nothing to do with the World but which engulfed the rest of the World nevertheless. 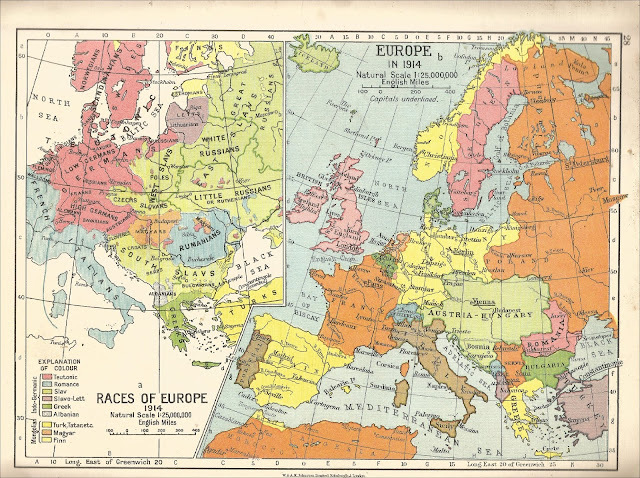 Note the map of the Races of Europe. You could do the same map of the Malay Archipelago with the various component 'Malay' races. Like the Europeans, the Malays are SERUMPUN. Who knows, if we had been given as much time and freedom from Colonisation as the European nations : the Malays of Nusantara could have 'developed' their Archipelago politically and advance the existing trading and mercantile network between their various entities. Perhaps like in the history of Europe, which was peppered with many infightings, wars, deaths by assassinations, guillotines and being drawn and quartered, internecine squabbles, rapings and lootings and having an incorrigible King like Henry VIII of England who changed the country from Catholicism to Protestantism just so he could divorce his first wife; the Nusantara might have gone through such a colourful tapestry of 'development' and nation building. The Malays and their Sultans , their Admirals, Generals and merchant class could have had a right old wild and gory romping history- just like the Europeans. Alas they were denied the political and economic 'rite of passage' that other civilizations went through. Because, along came Western firepower, Capitalism and Christianity and the huge import of foreign workers to service the purpose of the Empire. 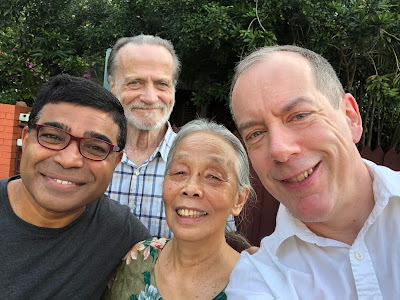 The Malays were emasculated into (so they claim) boring, lazy, indolent, untrustworthy, shameless people; and everything else you can throw at us, including the kitchen sink and our Value System! The Malays they reckoned. should be left as padi farmers, fishermen, policemen and also cannon fodder to protect the Empire and later their Tanah Air. Oops, I forgot. When the Malays leave their cosy villages for the urban centres, they can be assured of vocations like becoming a driver, a gardener, servants (but not chefs because you see, they have this particular aversion to the pig!) and if they can read and write, maybe they can be employed as peons and office boys and mailmen. Just think what the EC is all about - to re-patch and unite the old warring nation states. One feature, amongst others, that member states are unhappy with is the freedom of movement of people across the borders within the EC. Wow, I thought. They inflicted that licence (for people who are as different to the Malays like chalk and cheese) on to our part of the world and we have to live with the toxic consequences. .... for the likes of Eric Liew. You did not just make "a rude comment". Thank your lucky stars that you are in the land of DYMM Yang di Pertuan Agong and not in Thailand. You have perhaps validated this version of the sayings of the great Chinese philosopher Confucius. ... except in your case your bete noir has not done anything "unto you". In fact you and your fore-fathers have had a free run to " do unto" this country and prosper. The ultimate question is, "How did this multi-racial,multi-lingual, multi-religious democratic country foster the foment of such renegades?" The maps in colour are from A New Atlas of World History by W and A. K Johnston and J W Bacon, 1956. The one in black and white is from Wheatons Atlas of British and World History,1949. I was taught this song during Music Class at Crescent Girls School during the late 1950s. ............ but we had not seen Charlie for nearly ten years. What a grand reunion for these two youngsters from Generation X and the septuagenarians from the post-War baby boomers. Yuwrajh and Charlie excelled themselves as guests. They not only belanja us for breakfasts and lunches but they also did the washing up! From New York I only requested one Calvin and Hobbes but they brought me four. The scarf, another gift from Mexico City makes a nice wrapper for me and for my C&H. By the way, I've read them all and all the rest of the C&H issues. Any more ... please? Lost at Bukit Ampang on Christmas Day. I sent a local guide to look for them. Had to give the guide a bag of peanuts for doing a good job. And of course we must have that 'selfie' though the spouse did look a bit lost trying to understand the technology of the Smart Phone. Yuwrajh and Charlie, do come back. Your room is waiting for you, here in KL and in Leicester. For us, in this December good things came twice. last few decades and I just felt like the most privileged teacher on this planet. Yuwrajh and Din (and friends) forty years ago. Din, Yuwrajh, Charlie - bless you all and your cotton socks. Sob, sob! Here's another song from my colonial style education days. Very, very apt.